On the most miserable day of a miserable tour, the most miserable moment for English supporters wasn't another tame tourist's dismissal or another slashing Australian boundary, although there were plenty of both. It was the realisation, midway through an afternoon of grim toil and ceaseless punishment, that this Ashes series is only halfway through. Normally this might be the cause for some stiff upper-lipped optimism - plenty of time to fight back, to turn it all around, the fat lady not even having packed her overnight valise and emergency tuck-box, let alone arrived in Perth to sing. Not this winter. Not in this contest. There will be no Wonder at the Waca, just as there is less chance of rain saving this third Test than there is the Swan River catching fire. It was a day so mortifying that even the few wickets Australia lost as they moved into a massive lead of 369 brought minimal cheer. When Chris Rogers went to make it a mere 157-1, it felt akin to watching your house burn down but finding 20p in your dressing-gown pocket. There is being beaten, and there is being dismantled. England lost their last six wickets for 61. Matt Prior missed a stumping off David Warner when the opener was on 13 and then watched him canter away to a century that contained 19 boundaries. So easily was Warner able to score that all but eight runs of his first 50 came in fours and sixes. So total was England's surrender that when Stuart Broad was sent to A&E for a scan on his injured foot, one expected him to be joined by other Englishmen suffering crushed spirits and broken hearts. "Losing is part of the game," former England opener Geoffrey Boycott told Test Match Special. "It's how you lose the game that matters. "There was just nothing there to lift the spirits of the supporters. The wheels are coming off, sadly. I never believed it but now I can feel it. "It's a 5-0 drubbing coming. I will never say people aren't trying. I know they are. I have been there, I know what it's like. But it's not there. Their brains are scrambled." Two-and-a-half Tests in, it has come to that: not pushing to win, not even battling for a draw, but trying not to lose too badly. After 1,576 days in metaphorical possession of the urn, England are about to cede it in a fashion that few expected, even if the potential headlines ("Ashes Thrashes", "Pomnishambles") should come as no surprise. Heads dropped, stumpings were fluffed and catches were missed. Then, the sight of Stuart Broad appearing on crutches at the end of the day after being hit on the foot by Mitchell Johnson gave the whole thing a calamitous feel. Now, even the most positive are wondering how England are going to avoid a 5-0 whitewash. I usually leave the headline-grabbing predictions to others, but even I am struggling to see how they will not get an absolute caning. Warner's missed stumping was not the only gift. Rogers was dropped on 28 by England captain Alastair Cook when Prior should probably have taken the catch cleanly himself; twice Prior let four byes escape through his legs as Graeme Swann's chastening tour took a detour round new lows. "Rogers and Warner might as well have gone out with flip-flops and cigars," TMS pundit Michael Vaughan told BBC Sport. 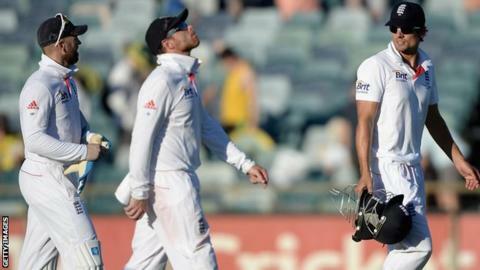 "This has been a dreadful, dreadful day for English cricket. It is never easy when you are watching a team that has this much talent play to this standard, but they are frazzled. "Prior is a pivotal member of this team, but you can tell that his poor batting is affecting his keeping now. The dressing room now will be the worst place in the world." Not many sports can mete out sustained dejection like a malfunctioning cricket tour. By this stage of a major football tournament a side on the wrong end of successive maulings would be gone before the serious business of the knock-out stage. One bad match is enough to end a tennis player's interest in a Grand Slam; the cut comes as merciful release to the hopelessly out-of-form golfer. Not in cricket. Not on an Ashes tour of Australia, where each additional defeated day serves only to increase the mocking one will receive over the remainder. There are some excuses for England. Locked into a relentless schedule of competition, stuck out in the field in temperatures that would be considered illegal even in professions that involve nothing more strenuous than typing, they look physically spent and mentally exhausted. They have also competed at times - on the first day at the Gabba, when they had Australia 132-6, or early on in Adelaide when Michael Clarke's men were wobbling at 174-4, or here in Perth when Australia were 143-5. England were even 143-3 in reply midway through the second day. But that is like a football team consoling themselves that they scored the first goal in a 5-1 defeat, or a golfer taking pride in two early birdies in a round of 10 over par. England have been comprehensively out-played: out-batted (Australia have the leading six batsmen by average in the series), out-bowled (they have the leading four bowlers) and out-fielded. After the 3-0 series win last summer, the momentum swing appears near total. Having been responsible for only three Ashes centuries in the 17 scored by both sides, Australians have now hit every one of the last eight; at some stage on Monday or Tuesday, they will take a corresponding lead in this series that could yet get considerably bigger. The 5-0 of 2006-07 was supposed to be an almost hallucinatory trough for England, a collective bad trip that clean living and better team chemistry ensured never happened again. Instead, seven years on, this particular horrible history could very well be repeated. "I remember being on the pitch after the 2010-11 Ashes, and there were a lot of the ECB hierarchy on the pitch, talking about how the Schofield Report in 2006-07 had changed everything," says Vaughan. "But it will be 5-0 here unless something drastically changes. Australia can smell blood. They're not going to let up. Australia aren't going to rest Johnson, Harris and Siddle because the Ashes are won - they'll want to humiliate you. "Australia will remember what's been said about them in the last three series - I remembered every word the likes of Hayden and co had said to me in 2002-03 when we lost 4-1, and it was payback time when Hayden and Langer came out to bat in 2005. "You say things when you're on top and winning, but things can change very quickly." For a gallery of images from day three, go to the BBC Sport Facebook page.